Baby chicks require special care – that’s pretty much a fact. What do you need for chicks? When do you introduce everybody? And they’re fragile! Luckily, in this episode, we delve into the care they need week by week, as we explore the first 6 weeks of your new flock members’ lives. 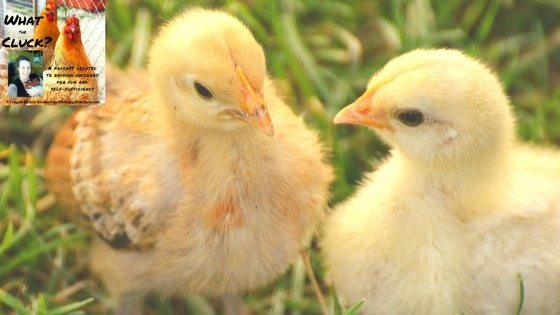 For baby chicks, there are certain things that you need to have before they arrive. You’ll need food, water, probiotics, a brooder, a digital thermometer, and a heat source. I feed baby chicks medicated chick starter because in my experience, they do best with it. However, you can give them non-medicated starter if you like. The difference between medicated and non-medicated is simple. Medicated chick starter has something called amprolium in it, which helps chicks develop a resistance to parasites that are naturally found in the soil. It’s not an antibiotic, since antibiotics don’t work against parasites. When baby chicks are born and when they’re younger, they have very specific nutritional requirements, so it’s best to feed an 18 percent protein chick starter. I always give chicks homemade organic apple cider vinegar, from the time that they’re born. We’ve been able to reduce our death rate by just providing homemade organic apple cider vinegar. The reason is the beneficial bacteria will help them develop good gut flora in their digestive systems. Put one tablespoon of vinegar in one gallon of water and feed once every two or three days just to make sure that they still have it in their system as they grow up. You can put it in their feed, but the waterer is best because chicks get dirty very easily with wet feed, and then they have a hard time staying warm. The next thing that you’re going to have to worry about is heat. Baby chicks have down, not feathers, on them, and they can’t control their body temperature as easily as an adult chicken. You should follow basic temperature requirements and use a digital thermometer so it’s simple to tell whether the brooder is too hot or too cold. Ideally when the chicks are born, for the first week, you want the brooder temperature to be 90 to 95 degrees. I have gone less than that and been OK, but for the sake of this discussion, we’re going to stick with the rule of thumb, which is 90 to 95 degrees the first week. Then you can decrease by five degrees every week after that. So week 2, the temp should be 85 to 90 degrees, week three is 80 to 85 degrees and so on. You’ll want to do this until the brooder is 75 degrees or until they’re fully feathered. I personally put a digital thermometer in the brooder to make sure the temperature is correct. If you see them huddling together, then they’re cold. If they’re cold, they’re not going to eat or drink. . If they’re happily walking around, looking for food and interacting, then they’re warm enough. If they are scattered all over the place, or if they’re laying down and a panting, then they’re too hot. Regarding heat lamps, I’m not a fan, and we have not had good luck with them, and almost burdened our house down a couple of times. Personally, I wait until it’s May or June, and I can be reasonably assured the temperatures will remain high enough for the chicks for their first few weeks of life. We’ve also used heating pads and those worked out very well. You just put the heating pad on the bottom of the brooder, and the chicks can get off and on as they please. Make sure your brooder has a top on it because by about week five or six, your chicks are going to start trying to fly out of the brooder. The other advantage to that is if you use a heat lamp, you can just rest the heat lamp on the top of the brooder, assuming the top is something like hardware cloth. When it comes to the amount of chicks in the brooder, I don’t put more than 10 chicks at a time. The reason is the higher numbers of chicks, the more likely some will get squashed or suffocate. One common question whether you can house chicks and ducklings together in a brooder. Yes, but I don’t recommend it. Ducklings are very, very messy, and chicks – which have down, not feathers – have a hard time regulating their bodies, and as ducks splash water, they also splash shavings and particles of food on the chicks, and the chicks can’t stay warm. If it’s above 80 degrees, the chicks can go out at any time in their life. If it’s under eighty degrees, we only put them outside when they’re fully feathered just to make sure that they’ll be OK.
We always make sure that they’re in a very, very safe tractor. We don’t want older chickens picking on them or a hawk to pick them off. They can still eat grass and bugs and lay in the sun, but they’re safe. Make sure you provide them with food and water at all times. Make sure they have shade. We introduce chicks to the hen coop when they’re about 12 to 16 weeks so the chicks are big enough to fend for themselves and so they’re not too intimidated by a hen. There likely will squawking and fighting as they sort out the pecking order disputes.If it goes on for days or if somebody is getting hurt, then it’s an issue. But if they’re just pecking at each other, and you hear squawking and some feathers flying, don’t worry about it. If you do have roosters, my recommendation is to wait until the chicks are 16 weeks old. We’ve had issues with roosters killing chicks when they’re not old enough to defend themselves. So at this point, we never introduce a chick to a coop with a rooster until the chicks are 16 weeks old. In this episode, we delve into the care your baby chickens need week by week, as we explore the first 6 weeks of your new flock members' lives. It’s best to wait until they’re fully feathered before letting them live outside permanently. Hope this helps!